This fillable "Veterans' Preference Form" is a document issued by the Oregon Department of Veterans Affairs specifically for Oregon residents. All documentation must be received prior to the date of the written test. Disabled Veteran (or spouse), but not both. 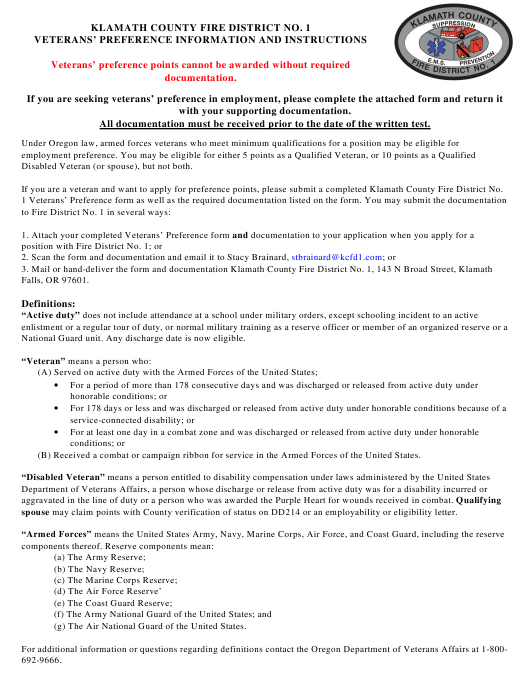 If you are a veteran and want to apply for preference points, please submit a completed Klamath County Fire District No. National Guard unit. Any discharge date is now eligible. (B) Received a combat or campaign ribbon for service in the Armed Forces of the United States. spouse may claim points with County verification of status on DD214 or an employability or eligibility letter. may qualify, please read the following information carefully and check the box(es) in each section appropriate to you. prior to the date of the written test. Department of Veterans Affairs indicating you receive a nonservice-connected pension). applied unless we receive the appropriate documentation prior to the date of the written test. receive spousal preference with Klamath County Fire District No. 1.